Cooling it down would have ather advantages, dissipation especially in newer chips can experience thermal runaway. I did some tests on mine and have some Peltiers on order. Interestingly some regulators seem to be worse than others possibly a poor quality issue and thats one of the first things I changed on my unit. RTL SDR is a great SDR. Nice performance with a small size and great heating function when listening outside at winter. Just thought id share my experience, I sit my rtl dongles in front of the airconditioner vent here at home. vent temp is around 4 degrees. No heat problems with my rtl stick thats for sure. Interesting information, Marko, that’s about 185F, didn’t realize how hot these chips get. 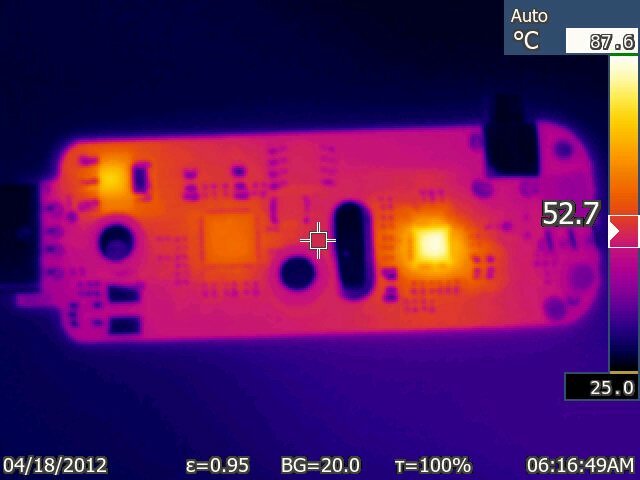 The thermal imaging is super. Thanks for the post.